In this well written alternative history novel, Germany has won the Second World War. The British army did not escape Dunkirk but was captured causing Winston Churchill to be replaced as prime minister and Britain to sue for peace. Germany went on to defeat the Soviet Union and the U.S. never got involved in the war. Germany is the dominant power with a weakened Britain trying to hold on to its empire. Both countries skirmish in Africa but otherwise peace mostly prevails. The Holocaust as we know it did not occur; rather the Jews of Europe are deported: those in western and central Europe to the German colony of Madagascar and the Jews of eastern Europe to Siberia. The events of the novel take place in 1953. One plot strand involves the British diplomat Jared Cranley, married to an Austrian Jewess , Madeleine, who fled the Nazis in the 1930s. Madeleine falls in love with Major Burton Cole, an English soldier who was raised in Africa, the son of missionaries. When Cranley learns of his wife’s infidelity, he has her sent to Madagascar. Cole seeks for her there. The second plot strand concerns Walter Hochburg, the governor or the German colony of Congo who learns of the possibility of an atomic bomb and seeks out Jewish scientists who worked on it before they were exiled to Madagascar. He hopes developing such a bomb will aid him in defeating the British and their allies who are making incursions in the Congo. He also happens to have been the man who ran off with Burton Cole’s mother (now deceased) when Burton was a boy. He is, as well, a mass murderer of blacks who defends himself by saying, “I’m a Utopian, not a murderer.” A third plot strand is that dominated by the melancholy, heroic Reuben Salois, who fought in a Jewish rebellion against the harsh German rule of Madagascar and later fought the Germans on the African mainland. He is recruited by Cole for a major sabotage operation in Madagascar that will encourage the U.S. to become involved in Africa on the side of Britain and the Madagascar Jewish rebels. It is a tale, then, involving a mixture of geopolitics and personal feelings. Love, jealousy, vengeance, ambition, loyalty, betrayal, and atonement all play a role. 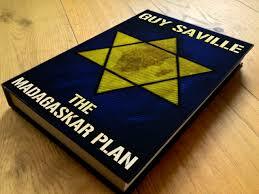 Mr. Saville juggles the multiple plots and rather large cast of characters well. He provides (alternative) historical background as well as personal background of the characters without unduly impeding the flow of the narrative.The characters are painted in bold colors but do not strike me as unbelievable. The only blemishes (and I consider them minor) are the reliance upon coincidence and the lack of explanation of Japan in the world order he portrays. It is interesting to note that the idea of Madagascar as a Jewish reservation (not a Jewish state) was seriously considered by a number of important Nazi officials, especially in 1940. That being said, the novel seems to offer no geopolitical lessons but is simply an involving tale of political and personal drama.